I kept the scarf in my main backpack when I traveled alone (Siem Reap to Bangkok). I remember feeling too exhausted when I finally reached my hostel near Khao San Road. 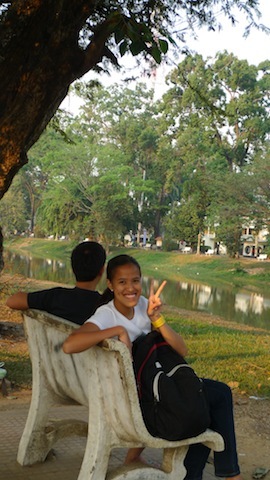 I decided to push through with the Chiang Mai trip the next day. The funny thing there is I only have a few money left in my wallet, but I still went to the popular destination of Northern Thailand. While I was inside the bus, I used Â the scarf to keep me warm. I had a good comfortable sleep and before I knew it, I am already in Chiang Mai – Freezing! I spent three nights in Chiang Mai and in all these nights, the scarf was by my side. I also bring it with me when I walk around during day time. I use it as a shield from the heat of the sun, to wipe my face, to cover my shoulders when I enter numerous temples and wrap it around my neck when I’m feeling really cold. Last Sunday, I originally planned to wake up early to explore Doi Suthep, the most remarkable tourist spot of Chiang Mai. I ended up staying in bed the whole morning and I tried to recharge since I’ve been walking for days. I realized I need to rest too. We chatted for hours and we also talked about the mystery guy (he’s our common friend). I guess my excitement took over that much. We took photos (thanks for the self-timer feature of our cameras!) and went out immediately to check the Sunday Market. I ended up buying some items to give as present to my loved ones. We bid temporary farewell to each other at 5PM since I need to catch the bus trip to Bangkok at the hostel. THE SCARF – Where is the SCARF?!?! $*#&@(! Where’s the SCARF?! I tried to look for it at my two backpacks, at my sling bag and even checked the items I bought if I placed it there. I also went back to the room where I stayed, the comfort room, the lobby and even asked some guests if they’ve seen it – but they didn’t. I tried not to panic, but I couldn’t. I then figured out that maybe I left the scarf in Starbucks. I asked the hostel staff if the bus going to Bangkok is on its way. She said yes. I asked if the bus will pass by Starbucks and she answered with a no. Tha Pae Gate/Road is closed every Sunday because of the Sunday Market. Waaaah! I just emailed Raymond and asked a favor if he can possibly pass by Starbucks just to ask if I left the scarf in there. The red taxi that will bring us to the bus station arrived and I had no choice but to go. I remember almost crying when I sat on my designated bus seat. I think my seat mate thought I was broken-hearted or something. Well, I am partly heartbroken. I considered that scarf as my security blanket since I’m exploring Chiang Mai alone. The scarf is also a reminder that I can do this trip on my own since the original owner did it with flying colors. I stepped back in Khao San Road once more and the memory of the missing scarf is still bugging me. Again, I tried to look for the scarf at my bags. No luck. Huhu. I left Bangkok still thinking about the scarf. I thought of buying a similar scarf in Greenhills. Even temples and monuments have replicas, right? But the original scarf is still different. It is a gift given to me and it served as my security blanket. I am sentimental, yes. What can I do? Yesterday, Raymond told me that he went to Starbucks Tha Pae Gate and unfortunately, the special scarf isn’t there. Coincidentally, the mystery man was online too. I told him about what happened and he said that it is fine. He will just give me another scarf next time we meet. I wonder when will that day be? Thinking about it, I’m such a crybaby. I am still looking at the sentimental value of things especially if these are given by sincere people. My security blanket in Chiang Mai might be missing right now, but at least it served its purpose. I just hope that the new owner of the scarf will find it useful to keep him/her warm in the cold city of Chiang Mai. aaww i’ll feel heartbroken too kung nawalan din ako ng valuable item. Wow! Reading this post makes me stop for awhile and ponder on life’s beauty and lesson that simple things teach us in a very memorable way. Very well written. 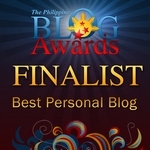 Hey Mica, you know your kind of writing is the main reason I can’t stop visiting your blog. It’s full of wisdom. And you know what. Your blog is worth sharing. So, I have mentioned your URL on my latest blog post entitled “World-Class Airport With The Most Reasonably Priced Food”. @chyng – Hirap din minsan mag-let go ng things noh? Makikita mo yan kapag hinding hindi mo na hinahanap. Harhar!